Anthony Crolla is set to take on Ricky Burns in all British lightweight affair on Saturday, 07 October 2017 at the Manchester Arena in Manchester. Its a massive fight for both fighters with huge domestic bragging rights at stake. However both fighters maintained mutual respect in the build up to this fight but come the fight night we can expect some proper british slug fest where both fighters are evenly matched. 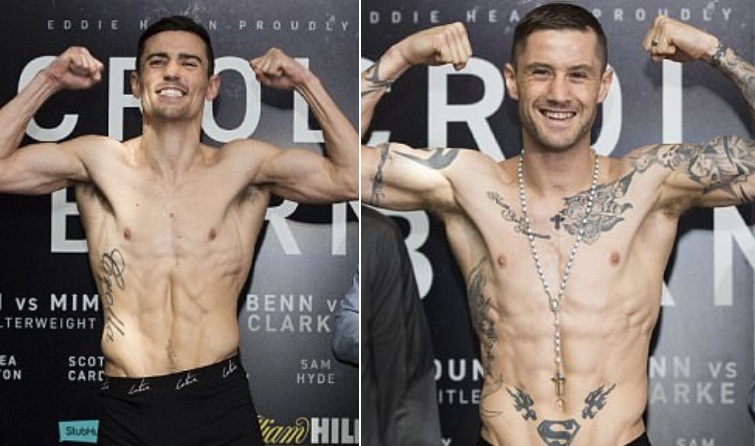 Crolla vs Burns Official Weigh-ins: Both fighters hit the scale under the agreed limit however Anthony Crolla came in slightly heavier than Ricky Burns at 9st 8lbs 9oz thats around four ounces heavier than his counter part. Anthony Crolla vs Ricky Burns Fight Coverage: SkySports are set to broadcast this fight live in the UK on their regular subscription channel (non-PPV) and they coverage begins at around 07:00 p.m uk time with several all british undercard fights. There are several good looking undercard fights including Sam Eggington vs Mohamed Mimoune and many more. Below is the entire fight night schedule of this card. Coverage Starts Coverage starts at around 07:00 p.m uk time with several undercard fights scheduled on the night. Manchester Arena will host a very exciting fight between two very competitive british light weight boxers on Saturday night, 07 October 2017. There is alot of pride and bragging rights at stake for both fighters who come in with pretty much similar records. Crolla of course three 4 years younger than Vatern Ricky Burns will be fighting his 41st fight and won 31 so far with 6 defeats and three draws. 34 year old Burns on the other hand turned professional way back in 2001 and so far has 48 fights to his name with 41 wins, 6 defeats and 1 draw. So there this fight is as competitive as you can get with Crolla slightly favourites considering his age however there is not much to split between the two. If you missed the live action you can always tune in here for live links posted before the coverage begins or visit this page after the fight to get full fight replay video.